One of the other new releases for November 2017 from Tamashii Nations is a surprise reveal. They have released the first photos for an upcoming S.H. Figuarts Batman from the upcoming Justice League film! 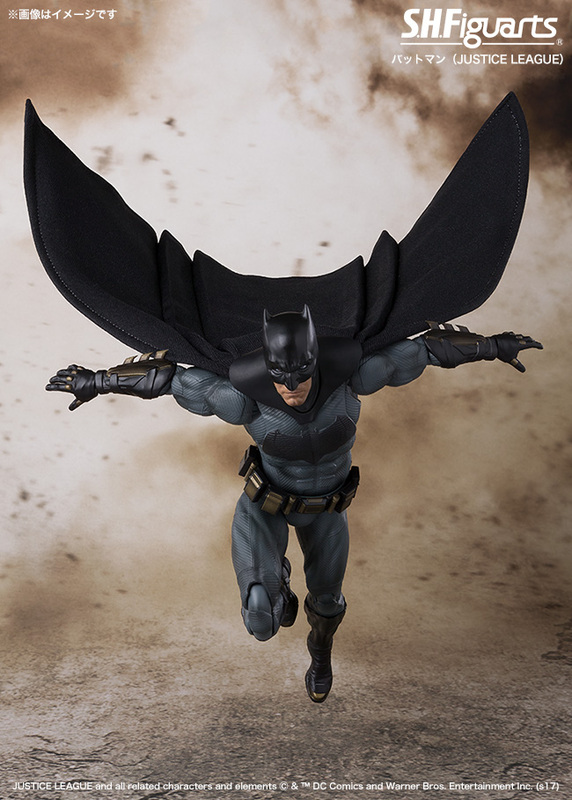 The figure looks to have a wired cloth cape and will include at least a few interchangeable hands and a Batarang. No additional details were revealed at this time. We will share more photos and info as they become available. See the new Batman photos after the jump. 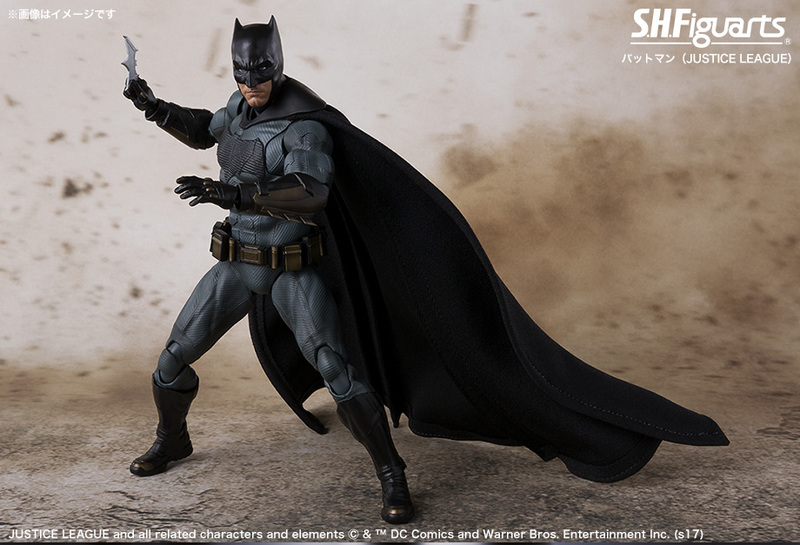 The next Batman from Tamashii is the Batfleck from Justice League. Accessories and price are currently unknown, all we know is that he will be a retail release in November. Expect more pictures and details next week. Damn, that doesn't look half-bad. Missed the Mezco BvS version, and don't like the proportions of the MAFEX version, so unless Mezco does another version for Justice League, I might have to pick this up. doesn't look bad, whats the size? 6"? Figuarts are about 6" in scale, yes. accessories like unmasked Heads, iam really disappointed. If I compare pictures of the two I think the Figuarts one is better looking. Just better proportions overall and the headsculpt of the Mafex one is kinda bad, at least compared to the Figuart. That's fair. Meanwhile, I'm happy how much they expanded over the last couple of years while offering more stuff I want with the same good quality. That sounds like they used to do it without exception and then stopped which isn't the case. Unmasked heads were always something which they rarely included as accessories. What does that even mean? They cover a huge variety of franchises nowadays, if you only collect one then yeah you might have to wait a bit. That's just how it works with high-end collectibles. You've criticized them for offering figures way after their corresponding movies are out in the past which I can understand, but I still rather wait and get the quality I want then to buy something cheaper just because it was out first. But maybe that's just me. Well, there's a reason for that, The Last Jedi. They are surely preparing a new wave for the movie and like usual we'll see all of them within a short time and then they go up for pre-order so they are out around the time the movie hits. The Rey they showed wears the Resistance outfit which seems to be featured in the new movie too, at least in the beginning, so they might save that one for this December. And the Finn they had on display was just the Stormtrooper version, maybe they just didn't think it would sell well enough. Hmmm...looks a bit brawnier and ripped than the Mafex version. And the head sculpt seems as if it has a slight comics-look stylization going on, Mafex's seems like more of a literal translation of what was seen in the movie.......unless of course, the cowl has been revised for the Justice League movie. Mafex for me. It just works better with the scale of American figure and the Knightmare is awesome. This figure looks awesome. I have the BvS Batman figures from Mafex and Mezco and while they're good, I don't think either really captures the look of the movie. The Mafex is too skinny while the Mezco doesn't look as ripped due to the cloth costume. This new Figuarts looks like it nails the look of the movie. Batman's cowl in JL is slimmer than the one in BvS. I think the idea they're going for is that Batman and Wonder Woman had retired but were called back into action in BvS. With Superman "gone", Batman is upgrading his gear so the suit and the Batmobile will look different in Justice League. I knew I'd end up buying more Batmans. Guess I'll have to get this figuarts regular suit and maybe go with Mezco for that new armoured suit unless Mafex impress me which is likely as they've been upping their game lately. 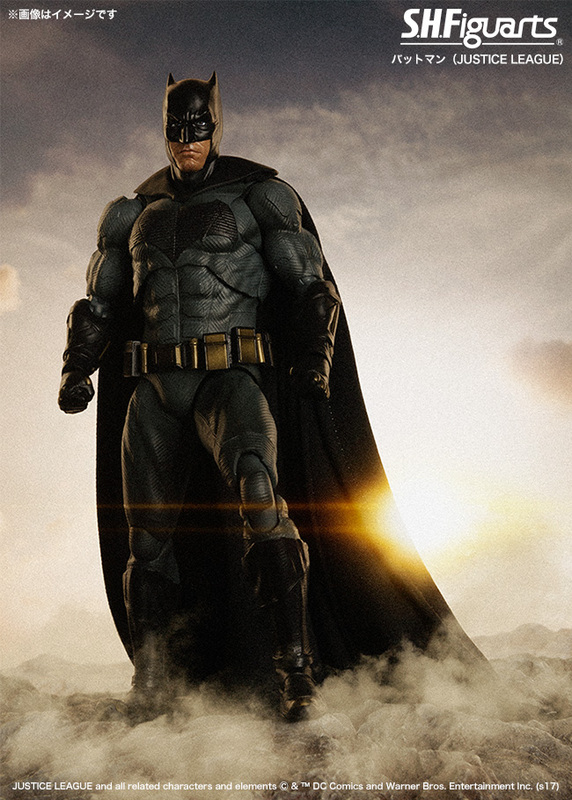 That Knightmare batman is pretty great. Only thing I'd change is to include a screaming face so I could pose him going full berserker. A posable jacket would've been great too but that's just too tricky in the 1/12 scale. Never wanted a DCU Movie batman....UNTIL I SAW THIS ONE. that thing looks on point!! Glad they're actually releasing it near the movie's release date, instead of a year and a half later. Ive skipped every BVS Batman that showed up, mainly because I didnt really enjoy the film. But with Wonder Woman being so good and Whedon taking over for Justice League, I may just be interested in this. I really hope they do Cyborg, I love his design in the film. cool thnx....yeah i really think i want this one.. This... actually looks really good. Better than the Mafex BvS figure imo. That said, they need to darken the gray of the suit. From what we've seen so-far it's a much darker, almost black, gray. I'm curious to see how a Mezco One:12th version would look. 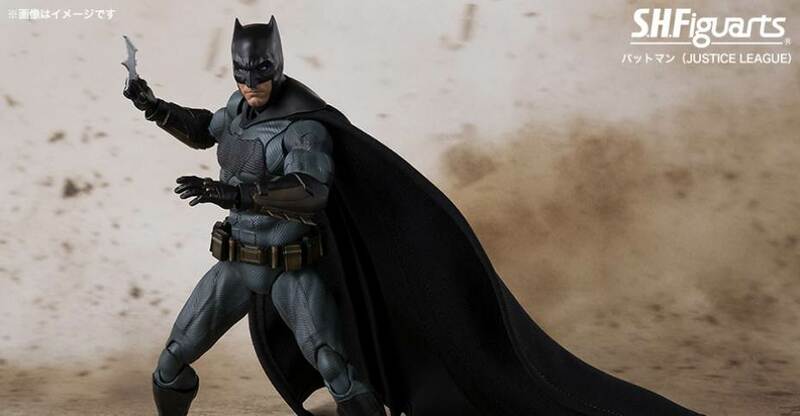 The item page for Batman is up, he'll cost 6,264� and comes with three additional sets of hands, a grappling gun set and a Batarang. Pre-orders go up in Japan next Monday, July 3rd. As always, thanks for the heads up. That Batman looks good too! I agree with one of the above posters. Mafex is the way to go but you probably need to get all 3 Batman figures. Knightmare is a must and completes the other 2. Mafex is in scale with American figures and figuarts are not is a major reason. Mafex for me, I will skip the Figuarts release.